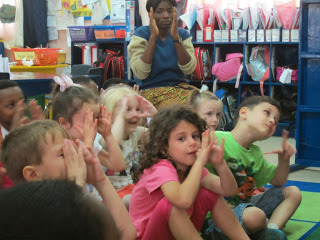 The road to the American School of Abuja is dusty and hot, but inside is is very cool. The teachers, the kids, the parents. 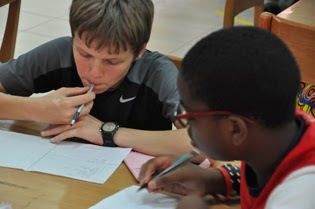 We arrived a half-day late due to the misconnection in Lagos and went straight from the airport to write with sixth graders in the library, eating Thai food in the car. Take out from the school. Unless you are an international teacher, it may be hard to imagine a school with Thai (or Indian, or Lebanese, yes all on the same day) take out. But, well, there you have it. International palettes are all served, right along with hot dogs and chips (those would be fries). Michael connected with the upper school and I rotated between elementary classrooms for the following two days. We wrote about rhinos, elephants, recess, and goodness. We held up our eye cameras in Kindergarten, because poetry is a snapshot! It is not a whole movie. Love this from the first grade. Read this aloud like we did. Go ahead. Read it again; draw out that last line…Yum. It was a fabulous visit. 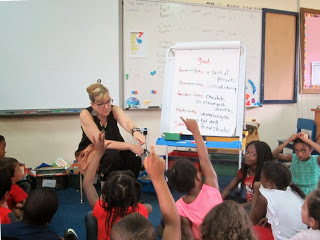 Many many thanks to all the teachers, the receptive, creative kids, the vibrant Head of School, Amy Lizoewulu, Principals Lyle Moltzan and Deanna Emond, thanks to Teri Campbell for the pictures and of course thanks to Rita who really knows how to make a library the heart of a school.